MUJIB BIOSPHERE RESERVE — Three decades after the establishment of the Mujib Biosphere Reserve as a sanctuary for the once extinct Nubian ibex, hunters still sneak into the reserve to try to kill the endangered animal, according to conservationists. Irresponsible hunters track down the animal as a “hobby and a challenge” between the steep mountains of its refuge, conservationists at the Royal Society for the Conservation of Nature (RSCN) explained, saying that they have foiled several attempts to hunt the globally-endangered animal in the Mujib reserve. Amer Akbi, one of the inspectors at the Mujib Biosphere Reserve, said that six hunting violations were registered in the reserve over the past year, one of which was the hunting of a Nubian ibex. “When a hunter kills one Nubian ibex, it grieves us, because the animal was extinct in Jordan not too long ago,” Akbi said during a recent media tour of the reserve. Over-hunting of the ibex in the past led to its extinction in Jordan and other countries in the region, prompting the International Union for the Conservation of Nature to categorise the animal as globally endangered on its red list. 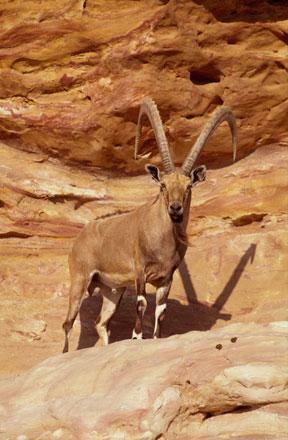 In 1989, the RSCN launched a project to reintroduce the Nubian ibex to Jordan within a 10-square-kilometres area in the Mujib reserve. Many hunters enter the reserve from its eastern edges, close to roads, farms and villages, in their search for the Nubia ibex, according to the inspector. The reserve’s 16 inspectors walk 10-20 kilometres each day to detect any violation, Akbi said, explaining that the rough topography of the reserve is one of the challenges they face. “In many cases the inspectors are also threatened with weapons, when they find the hunter and try to document the violation,” Akbi noted. The reserve’s director, Hashem Dheisat, said that the impact of violations on the ecosystems and wildlife of the reserve is mounting because hunters are now using automatic weapons, silencers and off-road vehicles. “A new generation of irresponsible hunters is emerging. They hunt with disregard for laws and regulations and they destroy nests and dens,” Dheisat told reporters during the tour. “Weak laws and even weaker enforcement” are allowing people to commit violations against nature, according to Dheisat. “In addition, some judges didn’t receive the message of the importance of protecting wildlife against violations,” he added. In 2006, the Nubian ibex was released into the wild in Mujib, according to the RSCN, which said that the project was a success. “A study is now under way on the number of Nubian ibex in the reserve,” Dheisat said, noting that a herd of 68 was spotted recently. RSCN figures in 2011 indicated that there were 600-700 head. The 212-square-kilometre Mujib Biosphere Reserve is the world’s lowest-altitude nature reserve. It is home to high-altitude summits and waterfalls making inspection and prevention of hunting a difficult task for inspectors, said Samir Bandak, a member of RSCN’s board of directors. The Mujib reserve, which became Jordan’s second nature biosphere in 2011, is located between Karak and Madaba governorates. Situated 90 kilometres south of Amman, the reserve is home to seasonal and permanent rivers which flow through several valleys, enabling the arid area to support diverse ecosystems and providing vital water resources for the shrinking Dead Sea. The richest vegetation is found in the valleys, including palm, wild fig and tamarix trees, oleander shrubs and reed beds along the river, according to the RSCN. Surveys indicate that the Mujib reserve is home to over 412 plant species, 24 mammals, three kinds of fish and 150 types of birds.